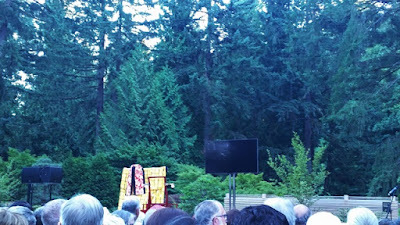 Special kabuki performances were held at the Portland Japanese Garden on the evenings of July 29th and 30th to open the Kabuki: A Revolution in Color and Design exhibition which ran July 29th through September 3rd. This was the first ever performance of Shochiku Grand Kabuki in a Japanese garden and the first U.S. performance by actor Nakamura Umemaru. The evening began with an introduction by kabuki actor Nakamura Umeno. As the sun went down, the crows in the garden began calling to on another from their treetop perches, providing a bit of unintentional humor to an already lively introduction. Umemaru took the stage to demonstrate how he applies his makeup and to be dressed with assistance and narration provided by Umeno. There are no makeup artists for kabuki, so actors must all apply their own makeup with the exception of the oshiroi (white makeup) on the neckline which can usually be applied by a fellow actor. We learned that actors may blend shades of red to create an original color that isn't available to the market. Bright red makeup lining the eyes and lips indicates a young woman. Brown makeup would be used for a middle aged role, and black makeup would be used for a villain role. First, bintsuke-abura (wax/oil) is applied to the skin to allow makeup to go on smoothly without smudging or sweating away. Then, oshiroi is applied to the face and neck and smoothed by patting with a sponge. This is followed by powder patted on to seal in the makeup. Lips and eyes are lined and filled in and eyebrows are drawn on last. Hands are painted with oshiroi after everything else is done. Kabuki costumes are usually silk rather than polyester, allowing for comfort and ease of movement on stage. The bow for a kabuki obi is a separate piece on the kabuki costume, unlike traditional obi which are one piece. White makeup and brightly colored kimono are easy to see in natural light, hearkening back to the early years of kabuki before the introduction of electric lighting. Umemaru's kimono for this demonstration featured a black lattice pattern on yellow background which showed up brilliantly against the darkening garden backdrop. To conclude the demonstration, Umemaru's wig was brought to the stage by the tokoyama (wig master). Kabuki wigs are made by taking a mold of the actor's head, creating a copper plate framework, and adding individual strands of hair. The wig for Tenaraiko weighs approximately 4.5 pounds and some kabuki wigs can weight up to 11 pounds. After a brief intermission Umemaru returned to the stage to perform Tenaraiko, a dance that has been in the kabuki repertoire since 1792. It tells the story of a young woman thinking wistfully on love while returning home from calligraphy lessons. She pauses along the way to play with butterflies, write a love poem, and perform a brief segment from Musume Dojoji. A hikinuki (onstage quick change) took place midway through the dance, revealing a vivid orange kimono that had been hidden beneath a pale pink kimono. Please enjoy this video featuring highlights from the performance.